Sweetberry honeysuckles look like an oversized, elongated blueberry. They are not only easier to grow than blueberries, but they also contain far higher levels of antioxidants and three times the amount of vitamin C. They are one of the hardiest edible plants on earth, tolerating temperatures as cold as -50°F (-45.6°C). filling. The fruits can also be dried or frozen to enjoy a taste of summer on a cold winter’s night. Water: Average water needs; tolerant of some drought once established. and the use of a shredded bark mulch is recommended. just one shrub will result in far fewer and much smaller fruits. sun and with good air circulation to minimize this fungal disease. other time of the year will reduce fruit set. can wait until a large quantity is ready to harvest at once if you prefer. encourage the formation of strong, abundant growth which will bear heavily the following season. Plants flower and fruit on old wood, so if pruning is required, do so immediately after harvest. Plant two different varieties for pollination. Planting two Sugar Mountain® Blue, for example, will not boost fruit production, but planting one Sugar Mountain® Blue and one pollinator variety like Sugar Mountain® Balalaika™, will. Research has shown that one pollinator to every 24 fruiting plants is sufficient in an orchard setting. Because plants fruit on old wood, your crops for the first few years may be hidden deep within the plant. Don’t miss them! Spread the branches apart and look for them closer to the base of the plant. Everyone describes their flavor differently. Many compare their taste to a cross between a blueberry and raspberry or blackberry. 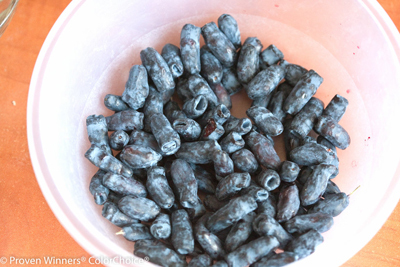 Their texture is similar to a blueberry, however, and the skin is very thin, soft, and melts in your mouth. They are sweet enough to eat straight from the plant. Do the berries have seeds? Sweetberry honeysuckle berries do have seeds, however, they are very small and not really noticeable much like in a blueberry. Is sweetberry honeysuckle a vine or shrub type honeysuckle? Shrub type. It forms an attractive, rounded, upright habit and does not need any kind of support or staking. Though many honeysuckles are problematic invasive plants, sweetberry honeysuckle has shown no signs of invasiveness anywhere it is grown. It does not run or sucker. How far apart can I plant my two varieties and still get fruit? winter dormancy. Therefore, shrubs planted closer together have a better chance at pollination than those planted far apart. Though you will likely still get fruit if you plant one in your front yard and the other in your back yard, you will get significantly more fruit if they are planted within 10’ of one another. If spacing them closely, place them about 5’ apart to allow for maximum growth. Are they like a holly, where only one of the two plants will get fruit? No. Every variety of Sugar Mountain® Sweetberry honeysuckle produces fruit because unlike holly, they have both male and female parts in every flower. You need to plant two different varieties only because each plant fruits best when it receives pollen from an individual with different characteristics than its own. Sweetberry honeysuckles are so tasty, you’re likely to eat them straight from the bush! But should you find yourself with a cup or so of these luscious fruits that you wish to transform into something spectacular, try this versatile compote. It can be spooned over ice cream; drizzled over yogurt or oatmeal; or dolloped atop pancakes, waffles, or sponge cake. Place sweetberry honeysuckle berries in small saucepan. Sprinkle ½ cup of sugar over them, and turn on medium low heat. The berries should quickly begin to soften and disintegrate. At this point, stir gently. Allow to simmer for 5-10 minutes, until juices thicken. Taste for sweetness, adding more sugar if necessary. Stir sugar in well and allowing to simmer a few moments. Squeeze in lemon juice, stir. Serve warm, or refrigerate until ready for use. Got more questions? We’re here to help! Contact us anytime.